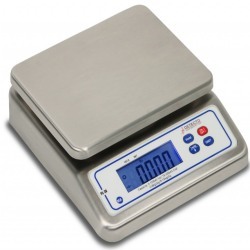 DETECTO PS30 compact countertop portion scale boasts a hefty 30 lb capacity and accuracy to 0.1 oz. The NSF-certified stainless steel PS30 is versatile enough for use in food service portioning, industrial, shipping, plant processing, and general purpose weighing. The digital scale weighs in pounds, ounces, pounds/ounces, pounds/ounces with fractional 1/8th ounce, and kilograms. DETECTO PS30 compact countertop portion scale boasts a hefty 30-lb/15-kg capacity and accuracy to 0.1 oz/2 g. The NSF-certified stainless steel PS30 is versatile enough for use in food service portioning, industrial, shipping, plant processing, and general purpose weighing. The digital scale weighs in pounds, ounces, pounds/ounces, pounds/ounces with fractional 1/8th ounce, and kilograms. These selectable units may be preset to display only those desired by the user. The scale’s IP65 washdown rating signifies that the durable PS30 is protected against dust and low-pressure water. The PS30 features five large 1-in (26-mm) high digits (plus fractional ounces) and a brilliant backlit blue LCD display that may be toggled on or off. Operation of the scale is simple with only four buttons: Hold, Tare/Backlight, Units, and On/Off. AC adapter (included) or 4 AA batteries (not included).